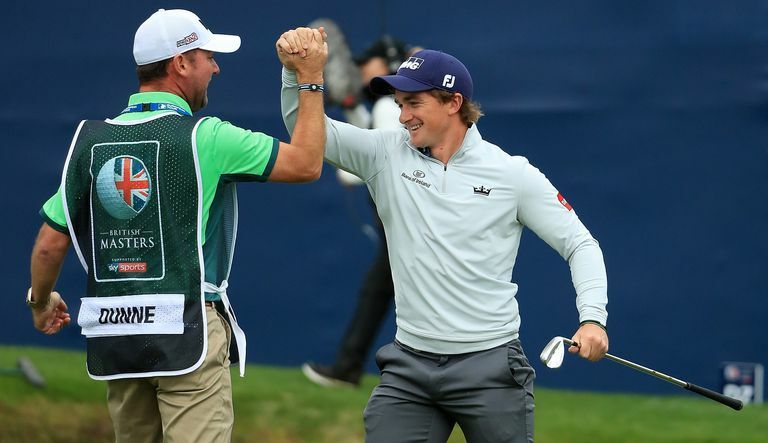 Paul Dunne celebrates with his caddie after capturing the crown at the 2017 British Masters. The British Masters golf tournament is a European Tour event played in the United Kingdom. It predates the European Tour, tracing its history to 1946 when it premiered as the Dunlop Masters, and has been part of the European Tour since the Tour's founding in 1972. The British Masters was discontinued in 2009 when it lost its title sponsor. It was then re-established in 2015 and has been played annually since. Description: The British Masters is a professional golf tournament on the European Tour. It is four rounds (72 holes) of stroke play, with a prize fund of £3,000,000. It is played annually. Location: In 2019, the location is Hillside Golf Club in Southport, England. Fun Fact: The first hole-in-one captured live on British television was scored by Tony Jacklin in the 1967 British Masters. Tickets are available from the European Tour ticket office, which can be reached by phone in the UK at 01344 840550 and outside the UK at +44 1344 840550. Interested fans can also email tickets [at] europeantour [dot] com for information. Tickets may be available at the gate on tournament days, but organizers recommend purchasing in advance. To do so, visit the British Masters ticketing website. Note that any tickets available at the gate will be higher priced than those purchased in advance. Ticket options range from single-day passes to five-day passes (Wednesday pro-am day plus four tournament rounds). Discounts are available for juniors and seniors. The British Masters rotates each year to a new golf course. Since it was re-established in 2015, the tournament has visited only golf courses in England. In 2019, that course is Hillside Golf Club in Southport, England, on the Irish Sea coast. It's a par-72, 6,953-yard links course that opened for play in 1911. It's tucked between Royal Birkdale Golf Club on its north and Southport and Ainsdale Golf Club on its south. During its history, the British Masters has visited many of Britain's finest courses, including several venues where it spent multiple consecutive years, like The Belfry and Woburn Golf and Country Club. The tournament has also been played at some of the Open rota courses, including Royal St. George's, Royal Birkdale and Royal Lytham & St. Annes. The current scoring record for 72-hole stroke total in the British Open is 260, established by Paul Dunne in his 2017 victory. Dunne's total bettered the previous record by a whopping six strokes. The current scoring record in relation to par is 22-under-par, set by Peter Baker in his 1993 win. Baker set another mark in that win with the largest margin of victory (seven strokes) in the tournament's European Tour era. Since the British Masters became a European Tour event in 1972, four golfers share the record for most wins with two each: Bernard Gallacher (1974-75), Greg Norman (1981-82), Ian Woosman (1983, 1994) and Seve Ballesteros (1986, 1991).